Part 1 of the backing up your Media PC covered the system drive, programs and configuration of your computer. That was actually the hard part even though it doesn't represent much space. This second (and much simpler) part covers everything else you want backed up (e.g. your Music, Videos, Photos, etc). As I mentioned in the previous article, the cheapest and simplest approach to backup is just to buy a large external disk. Another option that is becoming popular is using a home NAS box (i.e. an external disk that attaches to your network v.s. your computer). They cost more than an external disk, but offer many cool and convenient features. I'll talk about home NAS options in a future post. For most of us, an external disk is the way to go. Also, unlike backing up your system, there is nothing complex about backing up your Media files. Simply making a copy is all you need to do. If you are really worried, you could keep additional copies if you like. To get started, just drag and drop (copy) your Media folders to your external disk. This works great the first time you make a backup, but what happens if you add some files? Or, what if you do a bit of housecleaning and reorganize a few folders? Or, what if you fix the music tags on some of the files? You can quickly see that it gets really hard to keep track of what files need to be copied to the backup. Of course, you could just delete your backup and re-copy everything (potentially disastrous and a waste of time). A smarter approach would be to use backup software, but in my opinion there is a simpler and more appropriate way to get the job done. Instead, all you need is file synchronization software that will only copy the files that have changed. 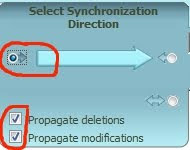 I've looked at a number of programs on Windows that do file synchronization. If you are going to trust your backups to a program, you want to be sure that it is reliable, simple to use, and fast. 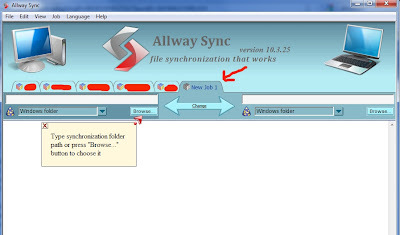 The one I've been using for a several years now is Allway sync. I had read good reviews about it and it is a breeze to setup. I tried a few others as well (like Microsoft's SyncToy), and didn't like any of them. However, the choice of software you use really isn't important so long as it works. I'll go over the setup of AllwaySync, but these steps should pretty much apply to any sync software that you use. Keep in mind that an external disk can copy data over USB 2.0 at roughly 1 GB per minute (consider using USB 3.0 and eSata if you have the choice). So, copying large Media files could take a while. This is why sync software saves us so much time. Note: Allway Sync is free for moderate personal use (another reason I like it!). However, the paid version is a quite reasonable $20. I setup Allway Sync using a number of Jobs. Each Job syncs a top-level folder between my data drive(s) and my external backup drive. Note: I use separate folders (v.s. syncing an entire drive) to keep my Media nicely organized. You can obviously use any organization method that works for you. To sync two folders, just add a new Job and you will get a wizard that will prompt you for the source and destination. If you have multiple jobs, rename them so you can keep track of them. I usually choose my source to be on the left pane, and my backup on the right. As above, I have configured it to always copy whatever is on the left folder to the right folder (including deletions). Note: The default is bi-directional sync (definitely not what you want for a backup). You could start syncing files, but wouldn't it be nice to know what the program is going to do first (before anything is changed)? That is what the Analyze button is for. Just select a job and click on Analyze. It will tell you what files will be copied, created or deleted. Tip: If you find that there are files that you never want copied (e.g. system files, temp files, etc), you can setup per-job file exclusion rules if you like. By default Allway Sync will exclude obvious system files like "Thumbs.db". 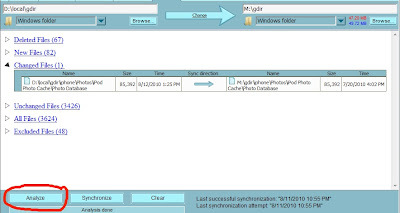 Once you have examined the list of files to be synced and you are certain everything looks right, just click the Synchronize button and the software will do it's thing. Only files that are different on your backup will be changed so it should complete quickly (depending upon what has changed of course). Feel free to run the analyze step again afterward and you should see that your backup is up to date. You can even setup the process to be fully automatic if you like. However I personally prefer to do my backups manually since I know when I have changed files that I want saved. This allows me to also leave my backup disk unplugged most of the time. What if I need to restore my files? This is one of the reasons I like using file sync software. Your backup is simply an identical copy of your source files (Media, etc). If you have a disaster (e.g. failed hardware or pilot error), you can simply copy the files from your backup. No special software is required. You can browse through your backup folders on your external disk using whatever tools you like. Backup software, on the other hand, often stores your files in a way that is not so easily accessible. Of course, it does this to make complex operations possible. However, for simple home backups (v.s. business use), I think this complexity is for the most part unnecessary. Keeping a backup of your Media is probably the most important thing you need to do on your Media PC. You can always reinstall software, but family Photos, Videos and other media are often irreplaceable. Fortunately, keeping a backup is simple and cheap so there is really no excuse for not doing it. 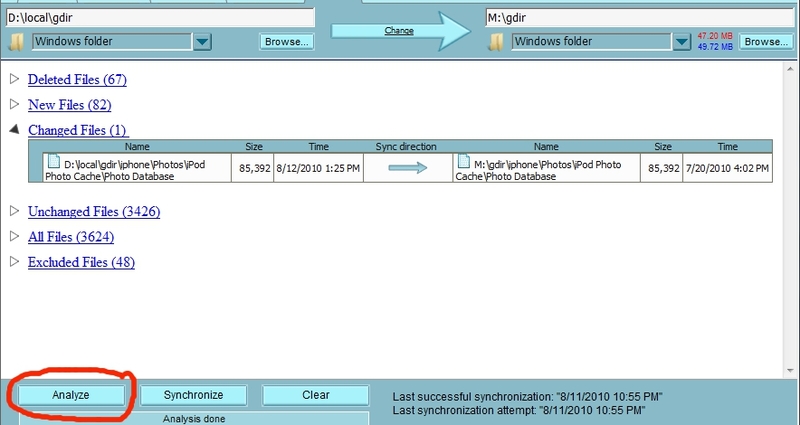 Furthermore, using file sync software makes keeping that backup up-to-date really easy. Finally, I'd be remiss if I didn't mention cloud backup solutions like SugarSync or even media specific solutions like mp3tunes locker. These solutions have their place, but really belong in a category of their own so I'll talk about them in a future post.